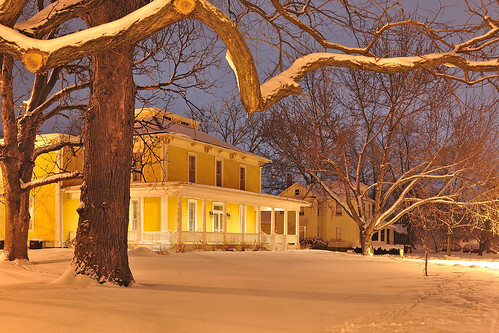 Located on the campus of Iowa Wesleyan University in Mt Pleasant, the Harlan Lincoln House. Built by Senator James Harlan in 1884 who was at the time president of the university, the house served as a summer home for many of beloved President Abraham Lincoln's descendants. How, you might ask, would "American Royalty" find its way to the open fields of Eastern Iowa when their society peers were surely summering in more traditional enclaves closer to the seats of American power? Like many mysterious circumstances, the answer is rooted in young love. During his tenure as Iowa's US Senator in DC Harlan's daughter Mary wove her charms around Lincoln's eldest Robert Todd. The match ultimately resulted in marriage. As Robert Todd rose the ranks of power in the years following his father's assassination, Mary and their children would often escape to Mt Pleasant and take up residence in the home. Lincoln family scholars will share that the Lincolns were known neither for long lives nor much procreation. As the blood lines drew to an end for the Lincoln family the house was donated to the University and today serves a museum with treasured artifacts from both the Lincoln and Harlan clans. Not to mention a beautiful reminder that Iowa in the eyes of many is awesome enough to serve as a treasured family retreat.